Generally, single player games are brain teasers. Our range covers a number of age groups, from preschoolers through to adults. Here are some that might pique your interest. 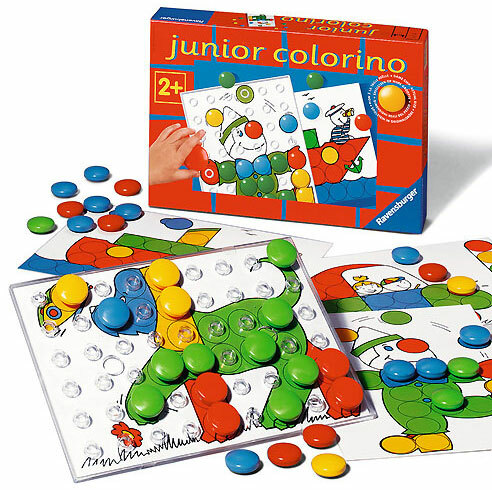 >> Ravensburger Junior Colorino Game (2+ yrs) is a simple game designed to help young children from 2 years of age, learn about the primary colours as they play. Essentially the child uses the large coloured tiles to 'colour-in' the picture card - the player selects and places appropriate coloured chips onto the transparent board which contains a picture card. The game also encourages the development of coordination and stimulates children's creativity. If you like multiple use games, this may appeal. Ludamino is a memory game, balancing game, and circuit game - all in one set. Comes with colourfully decorated 3D shapes, coloured and picture dice, and 6 cute little animals which little ones can use in their imaginary play. 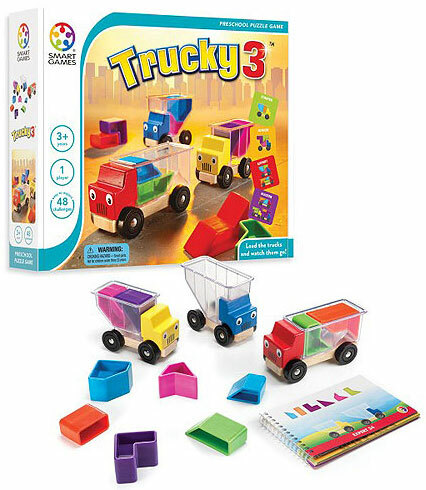 >> Smart Games Trucky 3 (3-8 yrs) is a logic game that also doubles as a toy! Trucky 3 is a multi-level logic game. Great for developing logical thinking skills and visual/spatial perception in preschoolers. The object of the game is to fill up one more truck with a specific set of puzzle pieces, as specified in the selected challenge. Like mini-tangram for little kids, the puzzle pieces are placed vertically instead of horizontally. None of the pieces should stick out higher than the border of the container. This makes it easy for a young child to know if a challenge is correctly solved. After, little ones can play with the trucks, driving them round like a toy car. The trucks are small and light, they fit perfectly in children's hands. 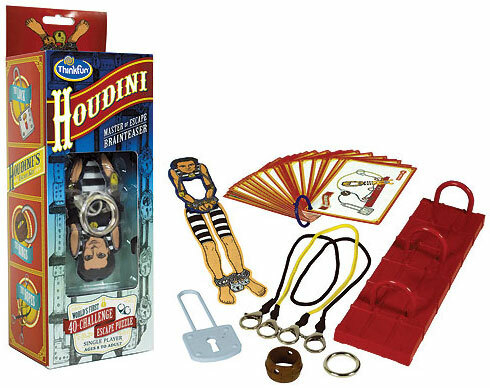 << ThinkFun Houdini Brainteaser Game (8+ yrs) is a logic game for magic fans, with 40 disentanglements and escape puzzles. Secure Houdini using the ropes, lock, and rings. Then work your magic to set him free without undoing the clasps. This game requires more fine motor skills than most other logic games. A logic game that appeals to Sudoku fans. Instead of numbers, you have colours! 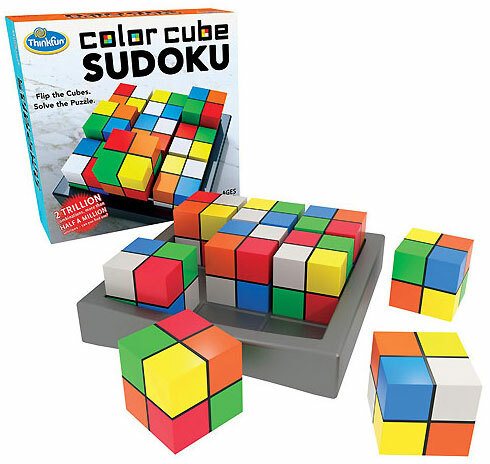 Flip and rearrange all 9 Color Cubes on the 3 x 3 tray until each color appears once in every row and column. Not quite an indoor game, although you could track the progress of your 'passed-on' cards indoor! 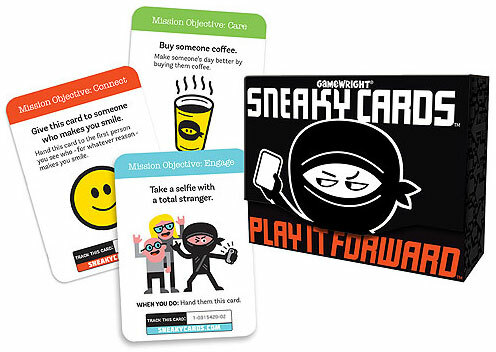 Sneaky Cards is all about completing the objective of the card ('the mission'), and passing that card onto an unsuspecting person so they can Play It Forward. Each mission encourages creativity and kindness. The deck contains 55 cards and five categories for the players to interact with: Surprise, Create, Care, Connect, and Grow. Each card also features a tracking number which lets players track the 'passed-on' cards and see them travel as they are passed from player to player. << Where's Bear is a set of props for various games, geared at little ones from 2 years of age. 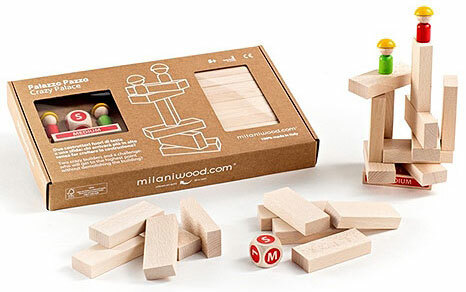 Included in this 'game' are five blocks, one small wooden teddy bear, and suggest ways to play. The blocks are beautifully illustrated and show the five rooms in Bear’s house and backyard. Each block includes multiple items to talk about and, learn to know and name. 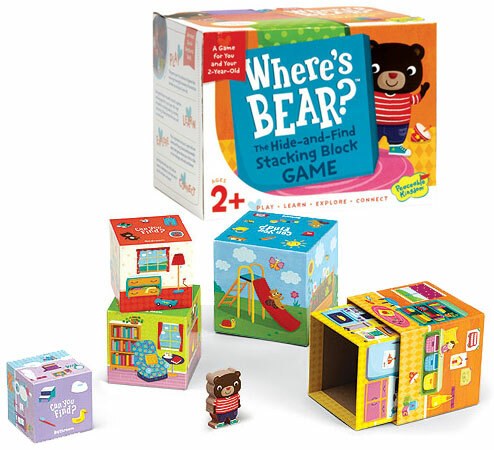 One suggested game combines the activity of stacking blocks and hide-and-seek: a player hides Bear and the other players have to find him. Another suggested game uses the smaller illustrations on the top of the blocks: you name an object on the top of a block, and then ask your toddler to find the object on the sides of the block. A little visual matching game that also reinforces knowing and naming objects. 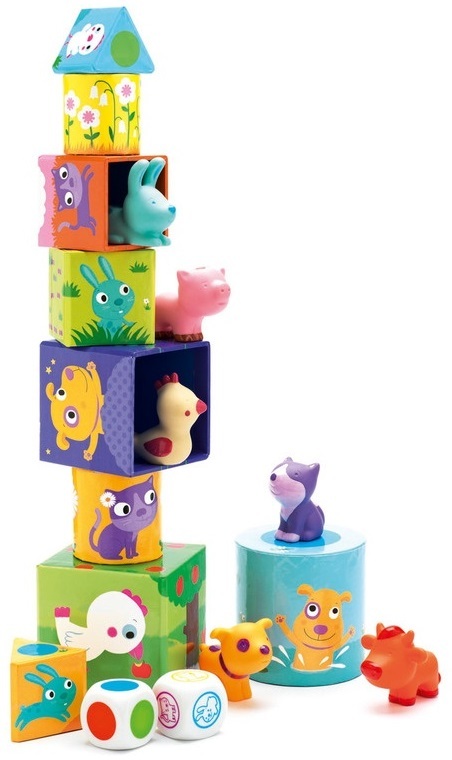 If your toddler likes stacking blocks, you might want to consider the charmingly illustrated Djeco's Stacking Cubes sets which come with play figures. 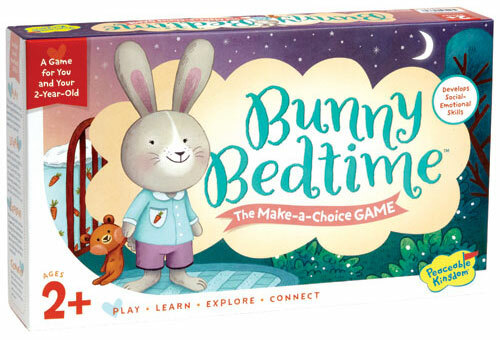 >> Bunny Bedtime (2 to 5 yrs) is a game that might help those trying to explain and establish bedtime routines with little ones. The game is designed for toddlers and young preschoolers. In this game, you and your little one make your way through five bedtime activities - bathing, potty, pajamas, brushing teeth, and reading a book. At each activity stop, little ones get to make a choice offered on the shaped piece for that activity. The last stop is, get a big hug and kiss, and “Goodnight, Bunny!”. 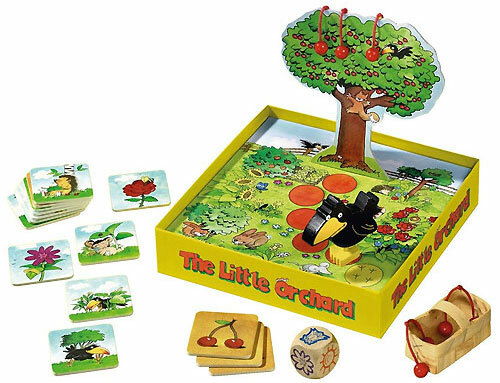 << HABA's The Little Orchard Game is a memory and cooperative game designed for 3 to 8 year-olds. The game can be played by one to four players. The object of the game is for players to work together to pick all the cherries before the crow works its way up the path to steal them from the tree. The symbol on the die determines the action to take, and players can only take a cherry off the tree when they find a cherry card (the memory part of the game). Included in the game is a lovely basket to put the cherries in. The game also helps players recognise and name colours & symbols, along with developing fine motor coordination. For a game review and further explanation on how the game is played, check-out this YouTube clip. 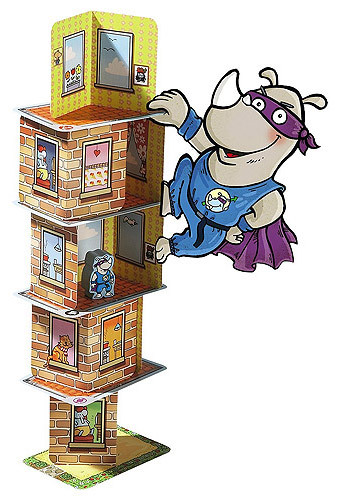 If you are looking for a great family game that is fun for all and quick to play, look no further ...Rhino Hero to the rescue! A game of two crazy builders - who will win the race to build the tallest palace?! The dice determine the size of the foundation and after that players take turns in adding a piece to the palace. Each time a player positions a block they must place their pawn on any part of the placed block. Players can also position a new block on the other player's blocks, but only without moving their own pawn. Who will make it tumble? In this game, all players are teammates and have the same goal. That is, a game where either everyone wins, or everyone is defeated. 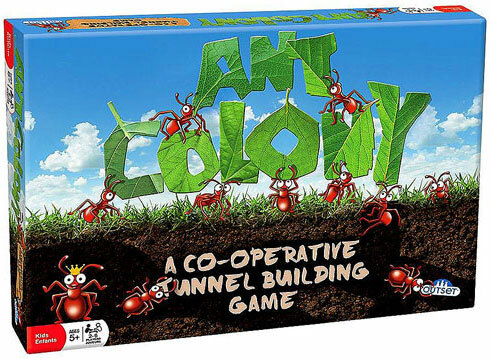 The objective of this cooperative game is for the players to build a new ant colony for the Queen Ant. The colony has to include at least two unblocked entrances and all four of the Room tiles. << Pie Face (5+ yrs) before, it is a cross between Russian roulette and the gag of getting a pie in the face. It is a mechanical device with an arm that holds a sponge which you cover with shaving cream to simulate the pie. When it is your turn, you place your face in the hole, spin the spinner and twist the handle the number of times that your spinner lands on. 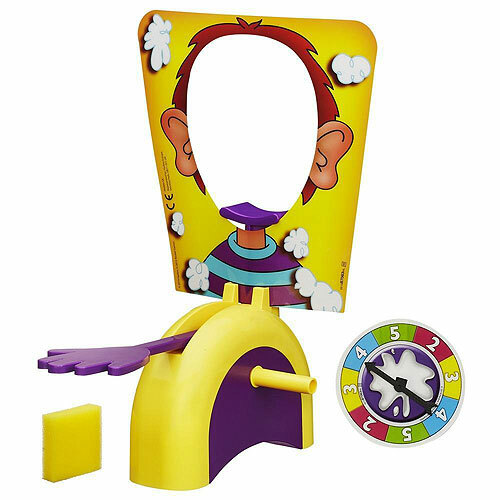 At each twist of the handle, everyone will be waiting to see if you will get a 'pie' on your face. If this sounds funny, check out Ellen's take on Pie Face and be glad this version doesn't support a pie-size of cream. 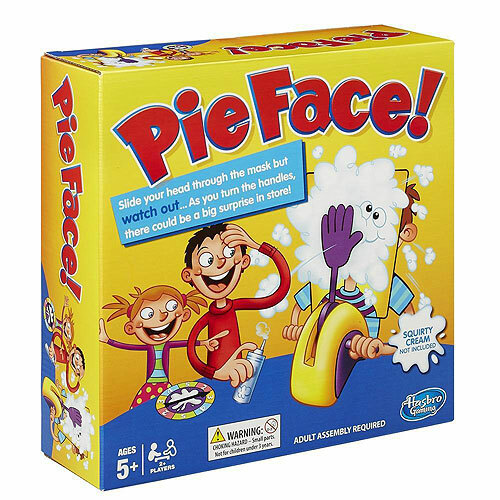 You can keep score, by adding points for the number spun for which there is no 'pie' in the face. Will you escape the 'pie' and have the highest score? 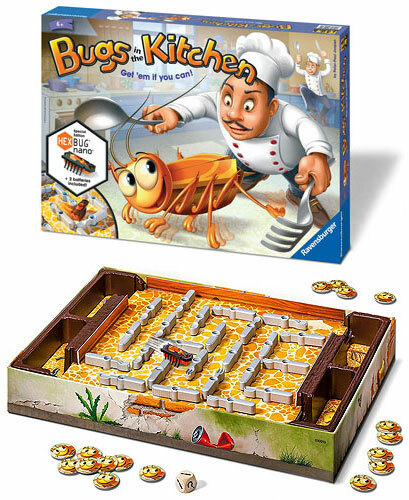 << Ravenburger's Bugs In The Kitchen (6+ yrs, 2-4 players) game comes with a non-person player, which comes in the form of a HEXBUG! For those that haven't come across a Hexbug before, it is a micro robotic bug that scuttles around. In this game, players are the exterminators and have to get the Hexbug into their trap, located at one corner of the board. The 'board' is a three-dimensional maze with 24 rotating utensils (knives, forks, and spoons). At each turn, players have to turn one of the 24 utensils, to redirect the bug toward their trap. 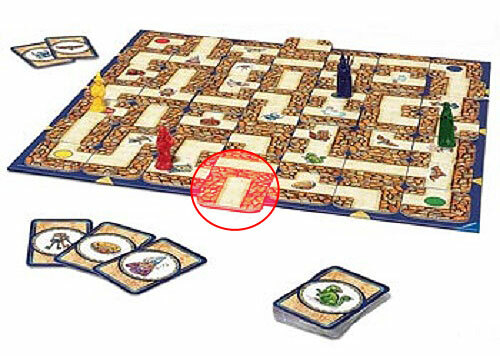 Players throw the die to discover which utensils they can turn. Catch the bug in your trap and earn a token. The first player to earn five tokens is the winner. Drop the Hexbug into the center of the board game and let the battle begin! 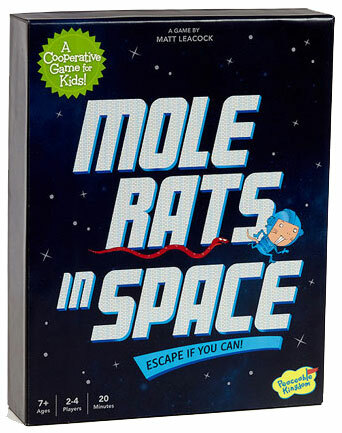 >> Mole Rats in Space is a cooperative game from Peaceable Kingdom, designed for primary school aged kids from 7 years of age. The game can be played by two to four players. In this game, players are mole rats on a research station that has been invaded by snakes. Players have to work and strategise together to gather equipment and make it to the escape pod before the snake invaders get them! This is one of my favourite all-time favourite board game. It is almost like a traditional cooperative game, except in this game one player is the criminal Mr. X, who is being chased across 'London' (the board) by all the other players who are the detectives. The aim of the game is for the detectives to capture Mr. X within 24 turns, while Mr. X tries to evade everyone. With strategy and teamwork, the detectives can trap Mr. X. However, if he escapes, he wins the game. The game has two difficulty level, which helps cater for the age and ability of the players. If this game piques your interest, now may be a good time to try it out as Ravensburger range is 10% off in May. 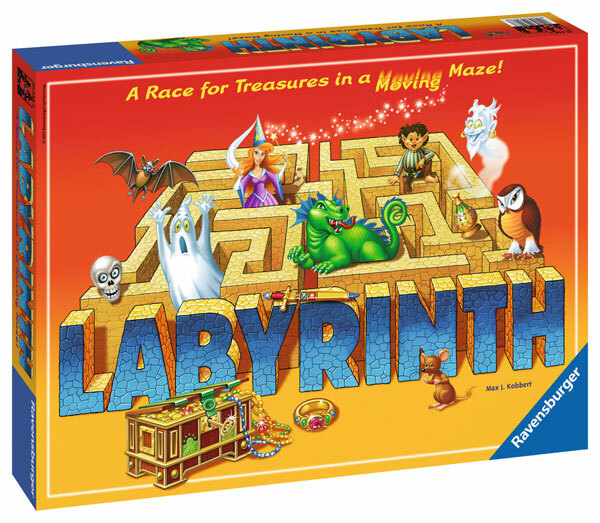 >> Ravensburger's Amazing Labyrinth (8+ years, 2-4 players) is an interesting game in that it is a board game where you hunt for treasures while navigating through a moving maze. In this game, there are 24 treasures represented by 24 treasure cards to get to, from where a player is in the maze. In simplistic term, the object of the game is to get as many treasures as possible. The tricky bit comes in the form of the playing board. The playing board is never the same in every game, and it does not stay the same within one game. The game comes with 'maze cards', which you shuffle and randomly place on the playing board to start. During play, the player whose turn it is, gets to decide what to do with the extra maze card. With this extra card, a player gets to shuffle other maze cards within a column up or down. Making the path through the maze easier for the player to get to a treasure or, to make it harder for another player. For me, I found that my brain had to shift gears a bit, to wrap my head around the two main aspects of the game - working through the maze (visual, right-brain) and the strategy of what to do with the extra maze card (logic, left-brain). This was particularly so when you know it would take a few turns to get to your treasure. The game is not particularly hard one to come to grips with. Serious board game players might not find this game particularly challenging. It is a great board game to play in a group of mixed skills, and great for light-hearted fun! 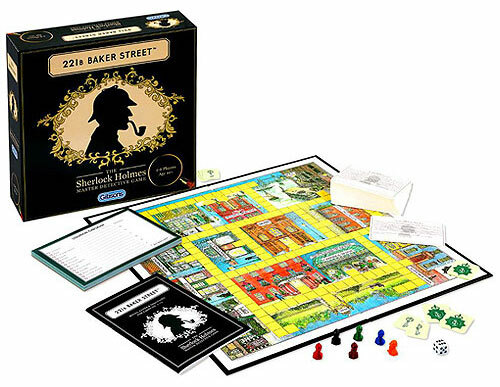 << 221B Baker Street board game (10+ yrs, 2-6 plyaers) is a game that might appeal to fans of Sherlock Holmes or detective board games. Sherlock Holmes fans would recognise the address 221B Baker St, as being Sherlock's home. 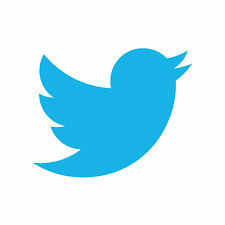 In this game, it also the starting point. 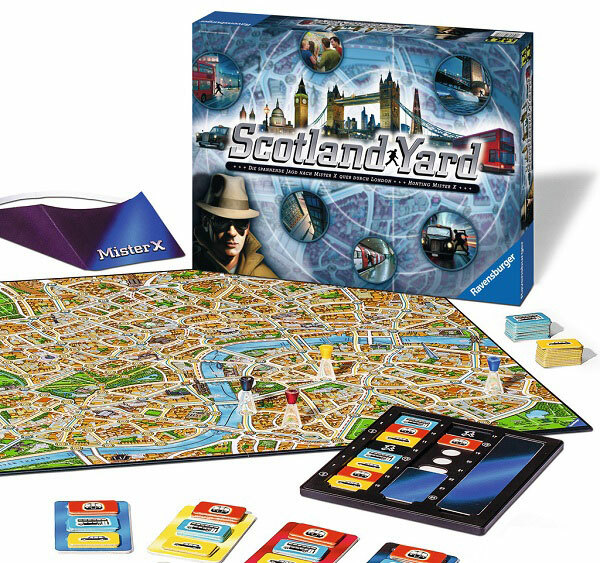 The objective of the game is to travel through the streets and alleys of London (aka the board), picking up clues and attempt to solve the intriguing cases before the other players. The game comes with 75 cases. Each case is represented by a card that features a crime told in story form, a selection of probable suspects and a list of locations involved in that crime. Players must collect clues from each location, noting them down on their checklists as they attempt to find the answers to the questions listed on the case card. The first player to figure out the correct answers, return to 221B and announce the solution, is the winner! One for the tweens?! 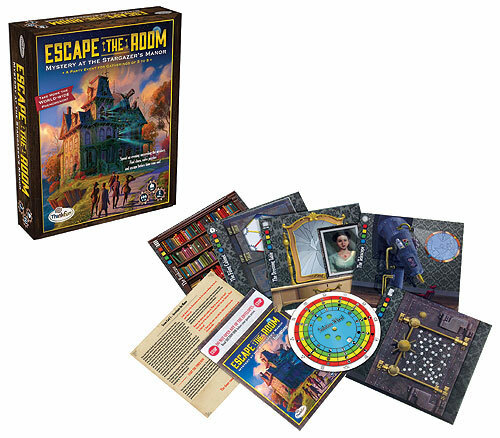 >> Mystery at the Stargazer’s Manor (10+ yrs, 3-8 players) is from ThinkFun's Escape The Room series. If you haven't come across Escape Room games before, they are physical adventure games. In these games, players are locked in a room and have to use elements of the room to solve a series of puzzles and escape within a set time limit. ThinkFun has come up with a way to play escape room game in your own home. In this timed party game, players must use scene cards, five sealed envelopes, and a solution wheel to solve puzzles and unlock clues before time runs outs. The solution wheel is the key to knowing if you have solved the puzzle. For a review of the game, check out this YouTube clip. When you have finished playing the game, reassemble the game and host another escape room party! 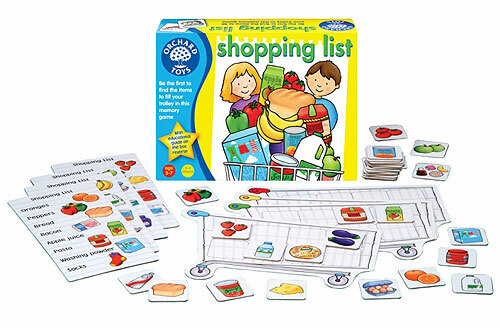 Orchard Toys is a British company that is considered as a leading manufacturer of educational games around the world. In today's world of outsourcing, it is becoming rare to find a company that hasn't moved their manufacturing offshore. Orchard Toys is an exception to this trend. They still design, produce and pack all their products from a small market town in Norfolk, England. Orchard Toys designs are bright, colourful and innovative. Combined with their education value, durability, quality, and that all the boards used are 100% recycled, Orchard Toy is an outstanding choice for preschool and early primary school age kids. 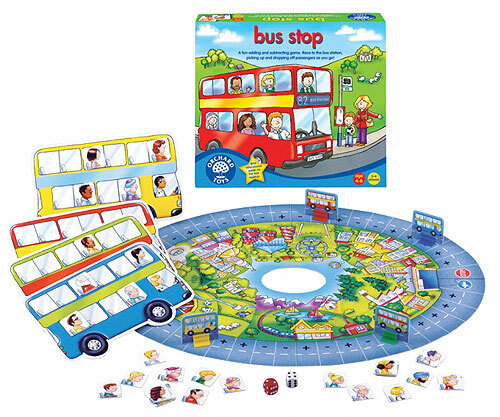 Bus Stop teaches little ones about addition and subtraction - what happens when the bus lands on a '+' or '-' sign. I love the versatility of the game, you could easily amend the game to get kids counting. 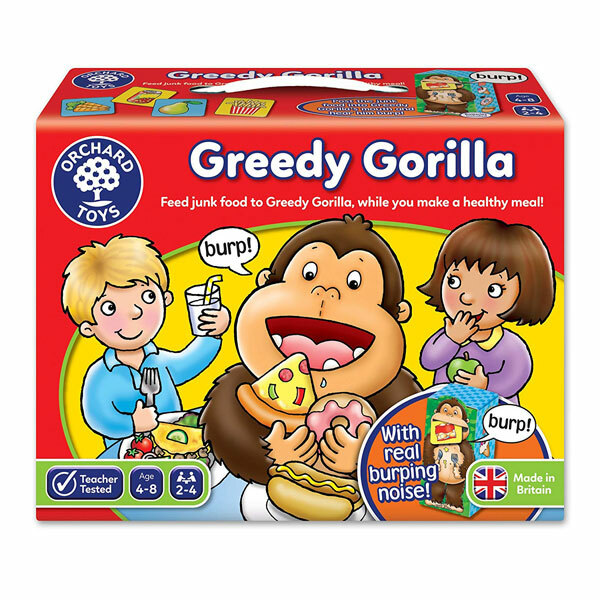 Then there is the classic Shopping List memory game, Greedy Gorilla game about healthy eating, Match and Spell a fun first reading and spelling game ..so many to choose from!